I usually donʻt post a test recipe. This is an exception. I am loving Just Mayo from Hampton Creek Foods. I wanted to see how far I can take this product. 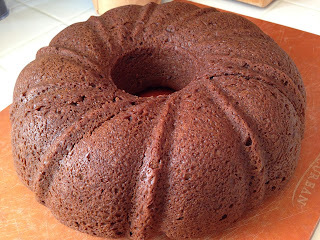 Chocolate Mayo cake is an old fashion cake, very popular in the 50ʻs and 60ʻs. It was supposed to be a recipe from a wife of a Hellmannʻs mayo salesman. She was trying to help her husband to sell more Mayonnaise! I also read it was a recipe developed during the Depression when eggs and butter were too expensive. There are a few versions of this recipe, most of them have eggs in addition to Mayo. I was able to found a recipe from Southern cooking and made some changes to my taste as well as based on the texture of Just Mayo. It is not perfect yet, but it will. Texture of the cake is good. It looks right. Taste is good, it also has the old fashion doughy-gooeyness. It is just sweet enough. With the sweetness from the frosting, it would be perfectly sinful. It is a bit crumbly. The outer part is a little dry. It cracked when I flipped it out of the pan. This could be an issue with my new oven and also the cake has no egg. The mayo was the emulsifier in this recipe. I may need to put in a bit more mayo. I used 1 1/4 cup instead of 1 1/2 cup as the original recipe calls for. I took the portion down since Just Mayo was not as thick as Hellmannʻs. I think I will keep it to 1 1/2 cup. I will also add 1/2 tsp salt. The original recipe use water, I am using brew coffee. I am planning to use espresso next time. It will also help to give the cake a darker chocolaty color. Since it was in a bundt pan. I baked it for 45 mins. I could cut a bit of time back 35-40 mins. I served this with a vegan chocolate fudge sauce. I just replaced the milk with coconut milk and cocoa powder and sugar with the semi-sweet chocolate in my Christmas fudge sauce recipe. It turned out to be very delightful and very sinful. I like the new vegan sauce more than my original recipe. It is very silky chocolaty, smooth mouth feel with a hint of coconut. This is a jar that you can eat with a spoon and wonʻt share!!! I know my non-vegetarian/ vegan friends will enjoy this greatly too. Gang... I think you getting this for Christmas!! Here is the test recipe I used with no adjustment. Try it, make adjustment and have fun. Let me know what you did and how it turns out. 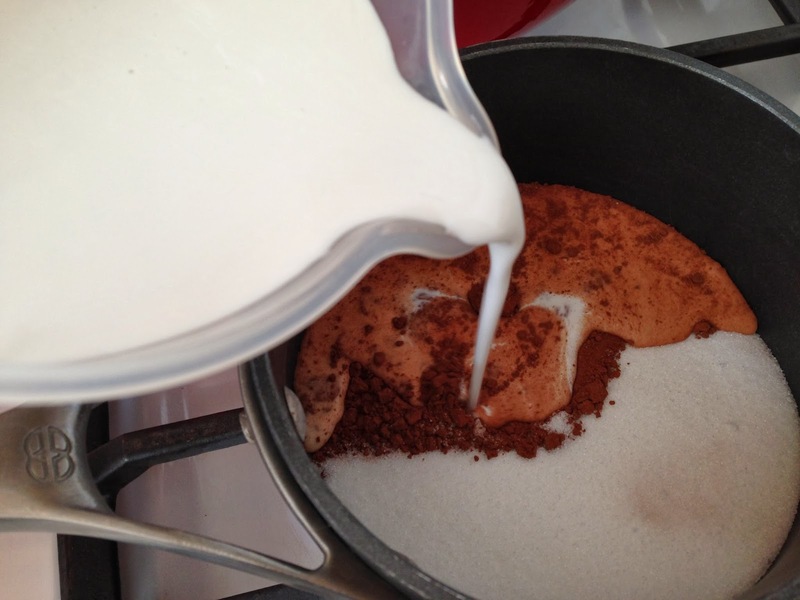 Mix flour, baking soda, baking powder, sugar and cocoa powder in a large bowl. Add just mayo to the dry mixture and work the mayo into the flour. Add coffee 1/4 at a time. Mix well each addition. Bake at 350 degree preheated oven for 45 mins for a bundt pan or 30 mins for cake pans. Remove the cake, check for doneness by lightly press on the center of the cake, if it spring back. Itʻs done, or you can insert a toothpick in the center. It is done when the toothpick is clean when you pull it out. Let the cake cool 10 mins. Invert the cake on a plate or serving piece. I had it on a board since this is a test recipe. 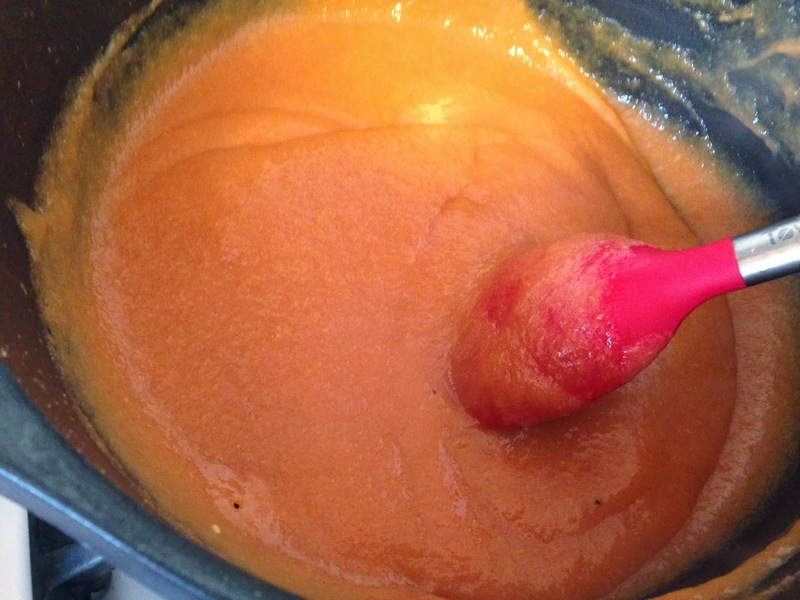 Simmer the sauce over low heat, stir or whisk the sauce to combine till it is smooth and silky. Remove from heat and let it cool for 5-10 min. Transfer to a container for storage or a sauce boat to serve with the cake. Good guava was hard to come by in the upper Midwest and most people donʻt even know what it was!! Itʻs guava season here in South Cal. There are so many varieties in the farmers market! !I am enjoying this greatly. My dear friend Mariam from San Diego found out how much I love guava, she brought me a large bags of the fruit from her neighborʻs tree. That family bought a home with 4 guava trees and they donʻt know what to do with all the fruit! Guava is hard to digest since it has a pulp of hard seeds inside. I canʻt really eat a lot of it. So... I made some guava butter last week. Itʻs great to top your plain yogurt in the morning, use it in desserts! Just loving every bit of it. The recipe is quite simple, but a bit time consuming since you have to put it through either a food mill or a strainer to separate the seeds. I am using the old fashion method with a little wrist action, a good strainer and a big spoon. It does the job and I donʻt need to store another item in my now tiny kitchen!! A quick note, I picked up a cheap strainer set with biggest mesh from Target, The guava seeds are actually quite big and guava has a grainy texture. If you have a very fine strainer, you will have a hard time getting the puree thought. I love my WMF strainer, but it just not right for this job! I am making a double recipe here. 6-8 medium size guavas. Cleaned, stem and ends removed, cut into quarters to make 4 cups. Return the guava butter back to the pot. Make sure you rinse the pot to remove any seeds. Bring the mixture to a light boil over low heat. It is best to use a diffuser in this step and stir constantly so that I wonʻt burn. 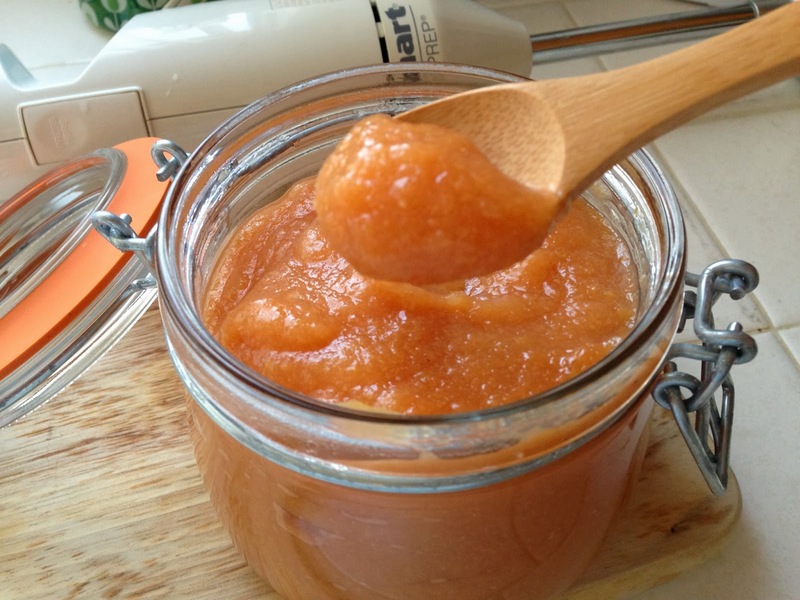 Pack the fruit butter in sterilized mason jars. Clean the lip of the jar. Cap. You can store this in the fridge or put it through a hot water bath to process. Great to mix a tsp in some plain yogurt for breakfast. As you may know by now, I like to bake. It is a form of relaxation to me. I usually bring all the baked goods to work or I give it away! A few of my vegan friends asked me to bake for them. I have a hard time with it since the finished products are not what I would consider good. One of the reason is lacking eggs. I read about Beyond Eggs and I wanted to give it try. I went to 2 Whole Foods, neither one is carrying the product. I was quite disappointed. However I came across another product from the same company: Beyond Mayo. Here is another ingredient that I have not found the perfect substitute when I cook for my vegan friends and clients. I wanted to give this a try too. When I opened the bottle, it smell like mayo and it tasted very similar to Best Mayo, with a very similar mouth-feel. There are many argument out there in the Hawaiian community. It is believed the best Mac salad can only be made with Best... Well I think we now have an alternative for our vegan friends - Just Mayo is just as good. I was so excite to put this to a true cooking test. I am very fortunate to live in South Cal, I am loving the variety of vegetable I found at the market. I picked up a few different variety of potatoes last week, blue, red (not just the skin, the flesh too), a few yellow fingerling too I decide to make a very simple potato salad. My mother used to tell me the best food is simple food, let the ingredients shine.. So here it is, just letting the potatoes and Just Mayo shine! PS: I am a little under the weather, the ulcer acted up. I am not supposed to have any raw, hard or spicy food(yes, itʻs very boring). I usually would not make potato salad. The mayo bothered me, it has raw eggs in there. Just Mayo didnʻt. Any plus! 5-6 medium size potatoes, I am using a mixture of different variety - red, purple and yellow. 1/4 tsp Herb de Provence or 1 tbsp fresh chopped tarragon. Clean and boil the potatoes with the skin on. When cooked, Drain and cool. Then peel the potatoes when it is cooled. Dice the potatoes into 1/2" pieces. Tranfer the potatoes to a medium size bowl, Add mayo, salt, pepper and the herbs. Fold the mayo mixture into the potatoes.